This evening at 2044 (local time) will be the fall equinox. The days will be shorter than the nights until spring. The fall equinox marks entry to the cool part of the year. This morning is no exception. It’s cool here this morning, Mother Nature celebrating entry to fall with cooler weather for us. I’m ready. A couple mornings ago, a hummingbird visited my house. 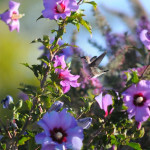 The Rose of Sharon always attracts them and I expect the little birds are migrating to their winter grounds. Wife loved these little birds and always got excited when one (or sometimes two) would visit. She put out the feeder several times. However, the only creatures that visited the feeders where the wasps. So, I won’t bother. 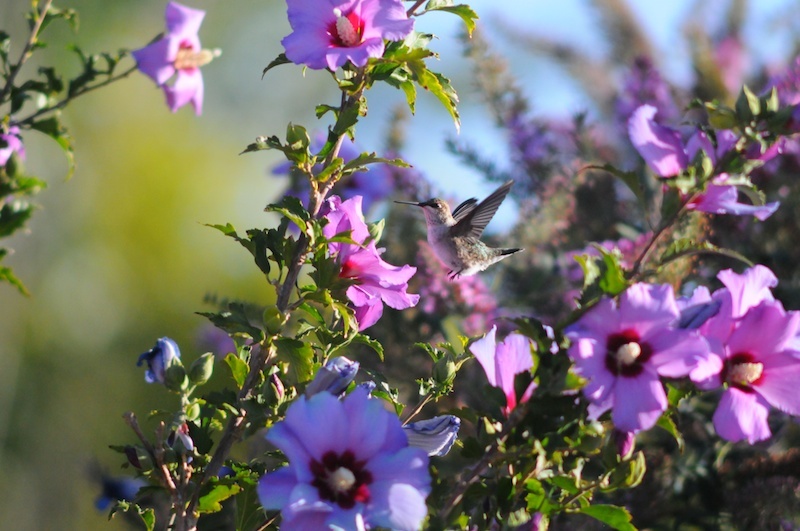 I’ll allow my backyard shrubs to provide for the little birds and keep the bees busy as well. When I noticed the bird working the bush, I put the Nikkor 300/4.5 on my D300 (new to me) and shot maybe 30 frames. Focusing the 300mm lens is a challenge with the D300 because the lens is not particularly fast and the viewfinder is not very bright (as a result). But, the manual focus lens is far less expensive than the autofocus versions and good optically. So, it makes sense for me.